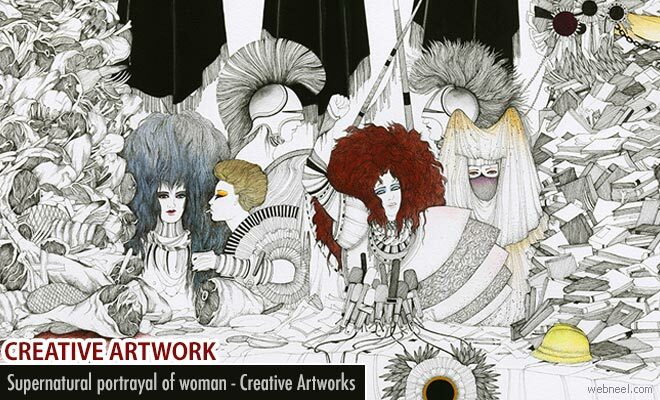 Creative illustrations : American artist Jen Ray depicts women in most powerful positions, landscapes filled with fierce, glamorous warrior commanders, motorcycle-helmeted bodyguards, and rock-climbing adventuresses in feathered neckpieces. She brings out powerful union of male and female in her own mystical characters. Women are shown in her art works in different forms such as powerful commander to obedient foot soldier, from tenderly nursing the wounded to plotting Machiavellian destruction. Intricate and detailed portrayal of women in her paintings brings out an elegant feminity which is unique and admirable. Ray's vibrant watercolour works are lively and emotionaly provocative.